Hi guys, I just had some recent luck doing some body and paint work on the integra and thought I'd share it. I did a pile of reading and thought I'd give it a try to save some $$. Depending on the size of the area to be repaired and the condition of your existing paint, its not a bad job, and anyone can do it. If your paint is badly faded, a blend wont work well, because of the missmatch in colors. This is a low budget way of doing it, and do so at your own risk, but even from 6 inches away it looks like a factory refinish for about $20 of materials and a day of work. The spot was on the roof of the car by the corner of the windshield and the total painted area was about 1 square foot. MASK EVERYTHING VERY WELL AROUND THE AREA, or you'll be using thinner like I was to take paint overspray off your sunroof. 1. I had some small rust bubbles, so I used a dremel with a grinder wheel and ground it away until it was fresh metal. 2. I used UV activated spotting putty (C.T.) and filled the larger low spots, I let it dry for 2 hours or so in direct sunlight. 3. I used a generic rust primer I got from a local TSC store but its pretty common. This stuff I found actually filled and smoothed the smaller gaps better than the putty and turned out to be really easy to sand. Because the tempurature was below 5 degrees in the garage, I constantly heated the area with a hair dryer to keep it warm. The primer was acutally fast setting and with the help of the hair dryer I resprayed after about 5 mins. I slowly built the primer up with about 8 solid coats until it was basically even with the painted surface. 4. I used a 200 grit sand paper, to level out the primer/putty, then went to a 600 wetdry paper to really smooth the surface out. Look at the sanded area and spray primer to reveal any imperfections that are still there. BE PATIENT. that was the biggest thing I learned. Resand if needed. 5. Respray the primer to cover any bare metal, let dry. This stuff was tack free in 5 minutes so it worked great. 6. Then I sprayed my first color coat in a light side to side spray pattern, let it dry until it was tacky, 2nd coat, repeat....... I think in total I applied about 8 coats of paint. 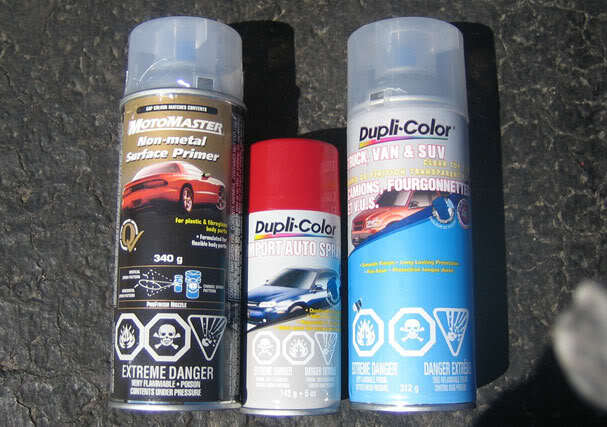 I used a lot of very thin coats, because the crappy tire auto paints are notoriously thin. 7. After the last coat is tacky and youre happy with it, spray your clear coat. Again just the generic C.T. clear. Once tacky, respray and again. I applied around 6 coats. 8. Let this thoroughly dry. Usually a minimum of 24 hours. Once the paint is completely dry, wet the area with water, and using a pad or your hand, sand with the 1500 grit sandpaper, until the surface of the clear is even and smooth. It'll look fairly ghosty once youve sanded it. you'll want to really hit the edges of youre sprayed area to blend the area into the existing finish. You can finish the sand with a 2000 grit paper, but I stayed with the 1500 and used the cheapo turtle wax rubbing compound with the buffer. 9. Once its smooth, gradually going from the rubbing or aggressive compounds down to the polish hit it with the buffer. A smooth shine should come out at this point. 10. Wait for a couple of weeks then wax and enjoy. Trust me its worth exerimenting. I probably saved 200$ doing this myself, and I'm pretty picky about body work. Good luck and if I can help, let me know. I'll post pics when I get my camera. good write up...but i wanna know one thing. you used primer in order to fill the area and made it level with the existing paint? sounds uncomplicated. i always thought body filler / bondo is what you have to use. there is a similar product made that is in a tube which is body filler express or something which is for sale at most ct and walmart places. the spot putty is used to fill smaller pin holes etc. im not sure if he mis-worded it, i personally had alot of problems with the pinhole filler and dont use it at all anymore, a good alternative is this stuff from ct motomaster, called primer and pin hole filler, looks similar to this can. Great DIY, I hate winter makes it so much harder to work on the car! don't do it... painting is an art szuberi... and the car is an expensive canvais for a beginner. i know what you are saying bruno....it should be done by a shop but i just thought i might give it a DIY shot..even if i screw it up...i can still take it to a shop later. actually...i have spoken with jay and right now trying to figure out a time to take the car to him in the coming weeks. sometimes the effort you put into DIY bodywork only adds more hours to the job later and will cost you extra money at the end. think of body work as dental work... grind the rust (cavity), fill it, cure it, shape it, finish it... would you do your own dental work? the less 'dental' work you have done the better. I had a similar situation where i had some minor scratches that were to deep to simply paint over. i purchased some all in one bondo applied about three coats sanded with 800 then 1000 till it was perfectly smooth. then through on about 7 coats of temclad automotive paint. i used the duplicolor the first time but had ****ty results. i def suggest tremclad over duplicolor. the dulicolor reacted with my original cars paint and ****ed **** up but the tremclad matched up perfect and you can honestly not even see where there was an issue. just my two cents. this is what i thaught but the **** u may use wil probly react with the paint that they use and can cause them 2 redoo the nice job they have done !!! the primer pin hole filler spray is not for dents it is for small pinholes in the drying body filler. for dents you will definitely need to use filler. the bodyfiller express is like a cawking tube just for quick filling but i would advise against using that, you should spend the time and the little ectra to get the proper filler for these jobs as they are time consuming and not wuick fix tasks. for the paint causing problems with professional materials shops use i doubt there are conflicting ingredients the only difference is probably quality of stuff in the stuff shops have. Mine had some bubbling not too bad compared to most Hondas, but as i attempted to sand it down and redo the body work there the whole inner panel crushed away like a cookie. the support for the rear bumper to screw in was also gone so i had to tie it up, get it cut out, rewelded and then i did mybodywork on it as I couldnt afford a full job costing 800-1000. and without all the special tools it takes a long amount of time to get it the perfect shape, for painting it is not as crucial for a do it yourself unpro job as it can turn out decent enough to drive around but a pro job is a pro job, i would like to get my quarters done again this spring and perhaps redo the whole panel or to save time i may jus spend the couple of hundred to have it done at a shop. Yeah if youre unsure, take it to a shop. Really the best way to do a touch up, and ONLY way to properly do a full paint job is with a booth, somesort of down draft setup, and a compressor and gun. I found the rattle can,produced a rough finish no matter what I did. I found the key is to wetsand the hell out of the clear, to bring it back to level, thats why I layered it on. when you applied paint did you tape the surroundings off..
if i am doing a whole panel i will tape off the surrounding areas for example the door. i will mask off the front fender, side skirt, window and quarter panel. for doing a panel and just fading it off, do not use mask as it will make a huge overscoring line. the best way is to use a piece of cardboard and spray from a distance and then use the cardboard to deflect the spray that way it limits the spray particles and fades it off, this techinique is alot easier then with spray and releasing on the can trigger! I used this technique on my quarter panel, i sprayed the whole back panel from the door to the tail lights and ended it off at about the rear pillar that connects the rear window and rear-winsdhield? which was the most inconspicuous area to fade it off. from there after it has cured after 1 week depending then i wetsand that area very lightly and use some polishers, or meguiars scratch X which is the most immaculate product to replenish paint! ya mine had bubbling which on the outside didnt seem to bad but the more i sanded it and went deaper the worse it got, ahaha mines was about 8 or so inches of bad area that needed to be taken off. would you recommend using fiber glass instead of the putty? or does that work best in terms of that?